CAUTLEY SPOUT.- This place, though not properly belonging to Lonsdale, is too important a feature of the Howgill Fells to be omitted. It consists of three cascades; the highest of which takes a clear leap of 400 feet and upwards. 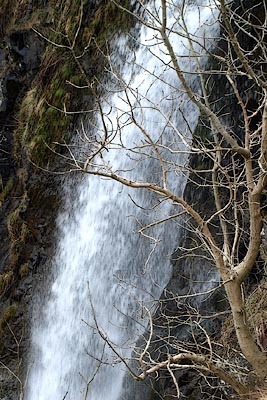 The whole height of the cascade, from the spout to the foot of the lower fall, has been measured as 860 feet. The south side of the fall is crowned by tremendous precipices and shelves of loose stone, called 'Cautley Screes.' The north side is particularly abrupt, and requires a firm foot, and a good head, to get either up or down. Print, halftone photograph, Cautley Fells and Waterfall, Sedbergh, Yorkshire, published by J W Braithwaite and Sons, Kirkby Stephen, Westmorland, 1922. Included in a guide book, Kirkby Stephen, 4th edn 1922. 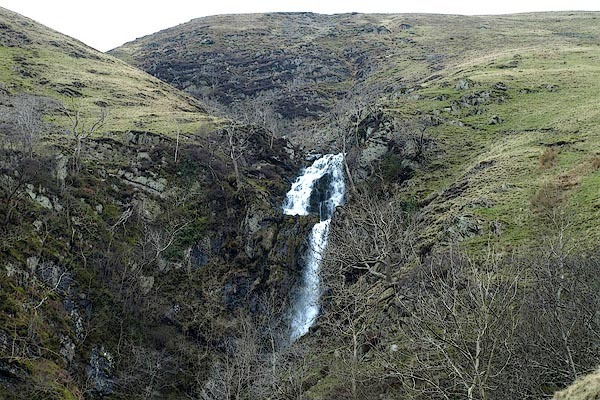 CAUTLEY FELLS AND WATERFALL, 8 MILES FROM KIRKBY STEPHEN. Guide book, An Illustrated Guide to Sedbergh, Garsdale, and Dent, by W Thompson, Sedbergh, published by Richard Jackson, Commercial Street, Leeds, Yorkshire, 1894. Print, engraving, Cautley Spout, Sedbergh, Yorkshire, published by Richard Jackson, Commercial Street, Leeds, Yorkshire, 1894. On p.78 of An Illustrated Guide to Sedbergh, Garsdale, and Dent, by W Thompson.